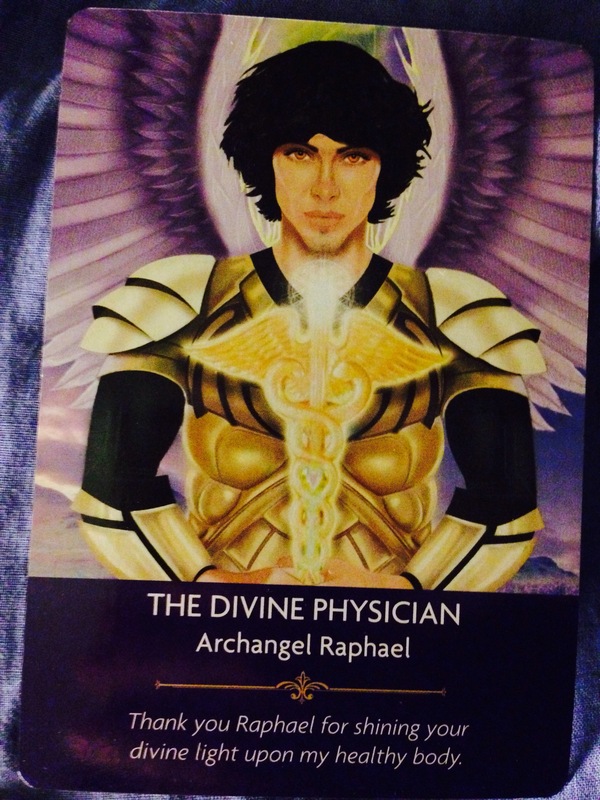 Card: The Divine Physician – from the Angel Prayers Oracle Cards by Kyle Gray. Message from the Faeries: Your body is such a magical and wonderous thing. When you really think about it, it’s quite the miracle. It’s a small universe within itself. You could look at it as either a microcosm or a macrocosm. It’s a beautiful and complex structure that houses your spirit. Some of you feel trapped by your body. It feels as though it’s holding you back and keeping you from moving forward in your spirit’s journey. From our perspective, it is keeping you anchored to this world for a reason. It serves such a great purpose in keeping you here on Earth. It’s why you born into it. You chose your body. You helped it grow from the moment of conception. It’s difficult to take responsibility for such a complex system. Some of you grasp on to your body’s technology right away. You learn to manipulate it and use it to your advantage. You can master the body. Some of you, on the other hand, have great difficulty figuring out how your body works and feel a slave to it. Either way, you all desire to feel comfortable in your body, just as you seek to feel comfortable on Earth. Wherever you are at with your body, this week we want to encourage to have a very honest open-hearted discussion with your body. Tell it how you feel about it. Tell your human vessel what it’s been like to live in it. Think about all the good times you’ve had in your body. Thank it for all it has done for you and for keeping you here on this wonderful planet. Tell it what you would like to experience in the future and ask for it’s love and support. Your body is temporary. It is ever changing as you age from infant to senior. It is made up of cells that are dying, multiplying, mutating, and growing. The body you went to bed in, isn’t the same one you will wake up to. When you die, it starts to decay and becomes one with the earth. Enjoy it while it lasts. Message from the Faeries: Last week was about pregnancy. It was about you becoming pregnant with new ideas, dreams and creations. We asked you to focus upon what you wanted to create next in your life. Well, this week we are asking you to start making steps to putting those wonderful new ideas into action. It’s time for you to take a leap of faith! A leap of faith does NOT mean that we want you to quit your job and join the circus – unless, of course, this is totally want to do and it just so happens that the circus is in town and they just asked you to join – what we are really talking about here is that you take a leap of faith in yourself and begin to take steps towards making your dream come true. It’s time to put action into your intention. Taking a risk on yourself and your dreams does not mean that you need to pack your things up and leave town – unless, of course, you just sold your house and the movers have just shown up – what we mean by taking a risk is that your dream may require you to get of your comfort zone a little. You might have to try something new. For example, your dream might be to write a book. This might require you to change your habits. Instead of watching tv for two hours every night after work, you’ll have to take that time for writing. This would be the next step required for achieving your goal. It’s time to take action. When we say: Take a leap of faith, we want you to really focus on the word faith. The most important part of faith is believing in yourself. We don’t care if you beleive in us, but what we want more than anything for you to believe in is yourself. You can do this! Whatever your dream is, whatever your heart desires, you can have it. Don’t doubt yourself, not even for a minute. You are a powerful manifestor. Look at the life you have already created for yourself! Truly amazing! What a wonderful creation. Beleive in yourself. You’ ve got this. Now go create. Card: Pregnancy – from the Magical Messages from the Fairies Oracle Cards by Doreen Virtue. Message from The Faeries: This is going to be a very magical week! Can you feel it?! We are so very excited for you. Some of you must be looking at this card and wondering if we are crazy. How on earth could you be pregnant? Well, for most of you this is a metaphorical pregnancy. You aren’t actually pregnant with a baby, but you are very pregnant with new inspiration, great ideas, and with wisdom worth sharing. This week you feel full of new life, wonderment and love. Spring is just around the corner for some of you, and this brings a time of great transformation. It isn’t time to give birth to those thoughts, ideas or projects just yet. This is the week of conception – inspiration. After this week, you will nurture and give love to your project, and watch it grow until you are ready to give birth to it sometime in the next coming months. For some of you, this week will bring you news of someone close to you being pregnant, and there are a few of you who will become pregnant or find out you are indeed with child. What incredibly wonderful news! As we mentioned last week, right now there are a lot of changes happening. There is a lot of intense energies, and lots of transformative waves happening here on Earth. Expect to hear about people choosing to leave this plane at this time, as well as the announcements of pregnancy and birth. You can use these energies for your own benefit. Take these energies and use them to purge your own life of what is no longer serving you, and harness these energies to create something new. Ask for guidance or signs to give you new direction. Follow your intuition. If you are at all feeling the need to write, draw, sew, or do anything creative, we urge you to follow that guidance. We hope you have a wonderful week. We love you! 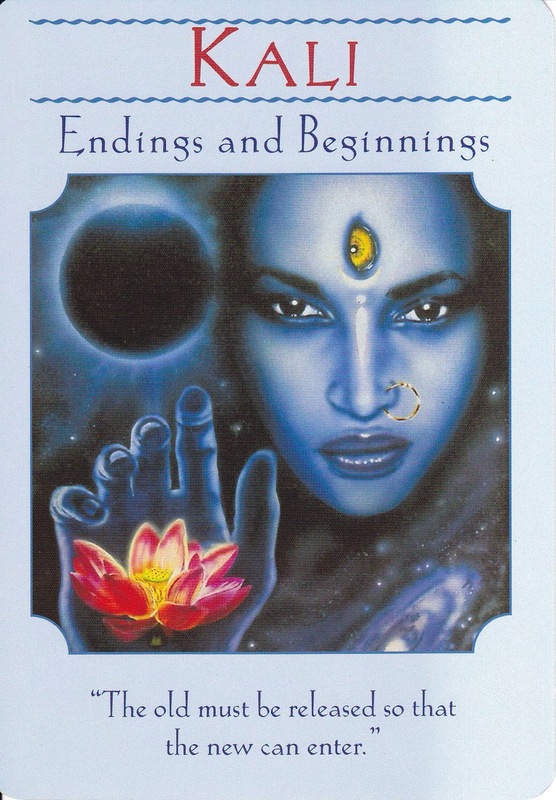 Card: Kali – Endings and Beginnings – from the Goddess Guidance Oracle Cards by Doreen Virtue. Message from the Faeries: Kali is the mother and destroyer of everything. The mother of birth and death. How awesome is that? She is very worthy of reverence and love, but there is no reason to be afraid of her. Those who are afraid of her are simply afraid of creation, transformation,change and death. She represents the most basic, foundational cycle of your existence. It is more wise to embrace these things that Kali represents, rather than be afraid of her. This week we urge you to embrace your own Kali goddess within, for it is you who is truly master of your own transitions in life. This is, indeed, a very transitional time. You may notice that there is an increase of people departing this earthly plane at this time. You will also notice that there is surge of life coming into this earthly plane as you hear of pregnancy and birth announcements. This is the cycle of life! You can not avoid it, so you may as well embrace it. What are you ready to destroy in your life? What are you ready to give birth to? There is no time like the present to let go of what is no longer serving you, just as there is no time like right now to start a new project. Is it time to look for a new job or start a new career? Is it time to leave your current location and start fresh somewhere new? Is it time to end a relationship and meet a new soul mate? These transformative energies are going to swirl about you this week. Are you going to allow yourself to get swept in to the dance of life, or will you fight it, kicking and screaming? The choice is yours. Change will happen no matter what. You can’t do anything about that, and sometimes the change can be painful. This is life. It’s your choice on how you view these transitions. If you are resisting the inevitable, you are only causing more pain for yourself in the long run. We hope that you allow yourself to open your hearts to the change that is coming, and that you choose to embrace new things in your life that bring you joy, love, good health, fun and abundance. What are you willing to let go of this week so that you can move forward? Is your heart open and ready to receiving the blessings that are coming your way? We know you are ready for change, but do you know you are ready? If you are feeling afraid of change, please ask us, your angels or loved ones for help. You are never alone. We are all in this together.